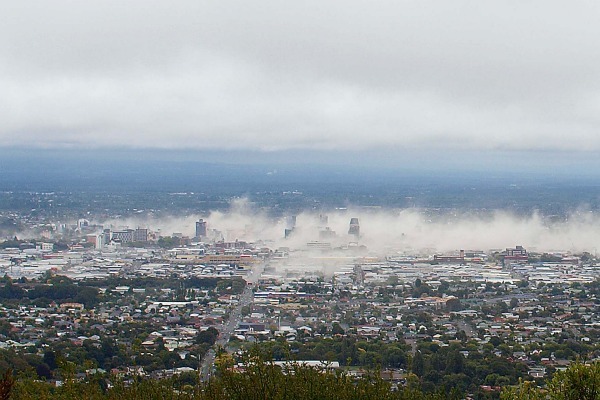 Back in September 2010 – nearly four years ago now, at around 4.30am on a Saturday morning, a large 7.2 magnitude earthquake hit Christchurch. I was fast asleep at the time, and can only describe the experience as terrifying. The sound is like a freight train rumble roaring towards your house, then everything starts to move so violently that you can’t stand up. I jumped up and went straight under my bed – I can’t normally fit under my bed, so I am not entirely sure how I got there. I could hear things smashing on the tiles in the entrance way just outside my room and assumed that the windows were all breaking, I thought the house was coming down. I didn’t fancy being trapped under my bed, so I decided to get out and stand in the door frame – which is what we were all taught. The reports say that the quake lasted for 40 seconds, but it felt much longer. New Zealand was created by two tectonic plates pushing against one another. All my life I remember being warned about earthquakes. There were ads on TV encouraging us to ‘get ready’ for the big one – which was long overdue. However prior to this event, I have only ever felt a few small earthquakes, and no one ever expected it to happen to Christchurch. So this earthquake was a huge shock. We had no power, no water and no sewer for days. The fronts of buildings had fallen down in the central city, houses and buildings were damaged, lots of chimneys fell down and squashed cars, businesses and schools were closed until engineers could inspect the buildings, the roads were all broken, huge sink holes opened up and we experienced ‘liquefaction’ which is like a wet silt that gets pushed up through the ground and invades everything in its path. My mobile phone rang soon after – it was my ex-husband checking in and advising that they and my son were all ok. I then contacted my Dad and his partner in Akaroa – they were ok, but had chimneys down inside their house. My brother and his family were ok too. I went next door and checked on my elderly neighbour, and she was ok too. My Mum was in the UK, so I tried to call her to let her know we were all ok before she heard over the news. Neighbours looked after one another, the students at the university formed an ‘army’ to go and help dig the liquefaction out from peoples gardens. People who were strangers before took care of others around them. People from other parts of the country sent food, money, supplies and many people left town to go and stay with friends until things settled down. We were very lucky that no one was killed. What I didn’t realise about earthquakes were the aftershocks. Some small, others sharp and violent. The city kept rocking and rolling with hundreds of earthquakes. We kind of got used to them. There would be a competition after each one to guess the magnitude and depth, we all became experts! After about five months I remember thinking that the aftershocks were getting fewer and further between. We were told that this would happen, that all the aftershocks would be smaller than the first big one. The airport was closed, so I decided to carry on driving in the rental car I was supposed to be returning to Invercargill. It took me eight hours to drive home. Possibly the longest drive of my life. I stopped briefly to buy a charger for my phone so I could keep in touch. I listened to people on talk back radio explaining what they had been through. 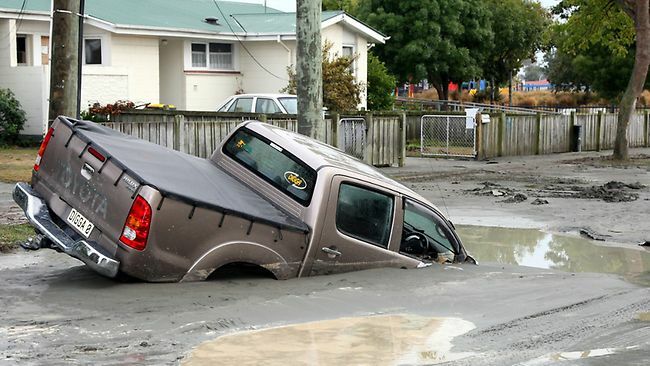 The roads were jammed, bridges were down, liquefaction and flooding was blocking other roads, everyone was trying to drive to get their kids, to their parents, to get home. It took hours before my son was collected from school. But he was safe and had been well cared for. My cousins were on the way to the airport to fly back to the UK when the earthquake hit. They spent the night on the floor of the airport hotel and I collected them in the morning and they came and helped my clean up all the broken glass and wine bottles at my house. Thankfully my house was ok. A few cracked tiles and walls, nothing major. Some parts of town were really badly hit. There were a number of issues, the liquefaction that invaded peoples houses, sinkholes appeared, and huge rocks rolled down hills and through houses. Thankfully New Zealand’s building code meant that while the houses were badly damaged. they mostly were still standing. So following the February earthquake, we have now had something like 15,000 aftershocks. One – in June, I can remember vividly. I was in my garage when I heard it coming and I jumped out on the driveway. I knew I was safe there, and wasn’t afraid of them any more, so I had time to look around, at the fence rippling, the power lines getting baggy and then tight, the trees shaking, looking through the window in to my house and seeing things falling over, the noise. I remember trying to soak it all up and when it was finished, I remember feeling hugely in awe of mother nature. The CBD was completely closed down for nearly three years while buildings were demolished. Businesses either closed or re-located. Some businesses lost everything – computers, files, equipment, stock. Backing up your computers off site made sense now! It was difficult to get new premises. The Government provided financial assistance to help companies get through the first few months. Now, four years on, new buildings are going up, the CBD is open again, new restaurants open each week, many houses have been repaired or rebuilt – many houses haven’t. In my job as an electorate agent for a Member of Parliament, I had a lot to do with trying to help people with their earthquake related issues. EQC – the Earthquake Commission was set up to collect a levy from every house insurance policy and to cover off the first $100,000 of any event. The trouble was that there were so many damage causing events, and the high court decided that EQC was liable for the first $100k of each event, so this created a massive amount of administration, trying to apportion damage to each event. Anything over $100,000 in any one event would be handed over to the insurance company to manage. EQC had their own project manager – Fletchers, who were brought on to manage the repairs under $100,000. The theory was that if they had managed repairs, then they could control the market. Had they just paid cash out to all the home owners, then the industry would hike prices, and people then couldn’t afford, or wouldn’t bother repairing their homes. This has been a long and drawn out process, but progress has been made and I think there are many things that could have been done better. I am hoping that there will be a better system sorted out for any future events. Other difficulties have included the changing building code, the land re-zoning (areas with liquefaction and rock fall were red-zoned and were given a Government offer to move out) then changing the red zoned areas again, designing foundations to cope with unstable land, repairing retaining walls, and how to deal with properties that had pre-existing issues. In addition to these issues we have had to replace pretty much all the horizontal infrastructure – i.e. drains and sewer. This has meant huge disruption in the roads. There are millions of road cones all around Christchurch, but every anniversary of the 22nd of February, we pick flowers and decorate the cones to remember what happened. So, the earthquakes have been a pretty amazing experience to be involved in. My son has lived nearly half his life with earthquakes, aftershocks, roadworks and a destroyed city. There have been winners and losers. People who had no insurance, those who were red-zoned and didn’t want to leave, people who wanted to leave, but couldn’t because their houses needed to be repaired. People who were in the CBD on that day will have a completely different perspective to people who weren’t. Some people were really traumatised by it all, and especially those who lost loved ones. Others have been more traumatised by the dealings with EQC and insurance companies. Others just take it in their stride. There has just been a mini-series released called ‘Hope and Wire’ which was supposed to tell the story of the earthquakes, however I didn’t like any of the characters. Still it did give a perspective of some different scenarios and experiences. Wow, I honestly had no idea how awful this event was! I dont know where I was in 2010 but I didnt know it was so huge like this… Im so sorry! It must have been a really intense situation. Ive never been in a situation like this before. Im glad all worked out good for you, family and friends. Thank you for sharing your experience, I really enjoyed reading it, everything was really interesting to me. Thanks. It was a pretty tough experience for all the tourists in town too. They couldn’t go back in to their hotels to get their belongings and passports etc. They accomodated them in a tent in Hagley Park. Would have been really traumatic for them I imagine. Ohh no… 😦 it must have been for sure traumatic for them! So sad… well, in Brazil we dont have earthquakes, at least not strong, and neither here in Germany. By in Chile is horrible, it happens almost every year, one of those years Santiago was almost destroyed, it was at the end of 2009 I think. Pretty sad, people couldnt fly back home. living in Japan for two years in Iwate, I was subjected to almost daily quakes at least for the first year. But in a place like NZ where they are not so frequent (until recently I guess) I can only imagine that the damage etc is much worse. Your pictures are enlightening as well as frightening. I only had a couple of serious shakes amongst so many smaller rumbles, but they were scary enough for me. I dont know how I would have coped if I was there on March 11 2011. thanks so much for sharing your experiences. I remember feeling a bit sorry for myself on that day and then seeing what had happened in Japan, I soon snapped out of that. That tsunami was so destructive. Just terrible. The photos on this post aren’t mine, they came from the newspaper websites. Cantabrians are a remarkably resilient people. Thanks for sharing! Wow! Your description of events really manages to convey the chaos,destruction and fear that an event of such magnitude brings. Worst i’ve had to endure was the hurricane in ’87,and that seems like a stroll in the park now i’ve read your account. I’m off now to count my blessings…….. Thanks and yes I count my blessings all the time. Have got a huge respect for Mother Nature that’s for sure! OH WOW! I don’t remember hearing about this at all! What a crazy scary experience! Mother Nature is for sure the boss! She sure is! Interesting how it is all consuming for us, but yet it possibly didn’t feature much in international media. The Feb quake where the 181 people died possibly got more coverage.